We believe our clients are experts in formulating the right value propositions to their customers to outperform competition. Yet, market turbulence requires not only to adapt the mix of products and services, but also to adapt the company’s capabilities to deliver strategic and operational changes. The bigger this change in terms of pace (little time to deliver, steep scaling) or in terms of complexity (many stakeholders, locations, divisions or …), the more conflicts arise, and the less it is clear which transformation path is to be followed to adapt objectives, processes, applications, data, structures, behaviour in a holistic and secured way. Papilium guides company’s key influencers and experts to establish the best transformation path to deliver improved cash flow when delivering business transformations. Our EDV © framework ensures we find value FACT based, leveraging disparate sources of data and emotions. It engages all stakeholders to GAIN real recurring value @ speed over the path of transformation, and beyond. “Our challenge is to understand what is hampering companies to refine and implement business strategies and to launch the “best-fit” transformation to create substantial value. Papilium delivers business transformations by giving commitment on “predefined results” or by delivering on “our best effort”. Either way, we have to exceed expectations. 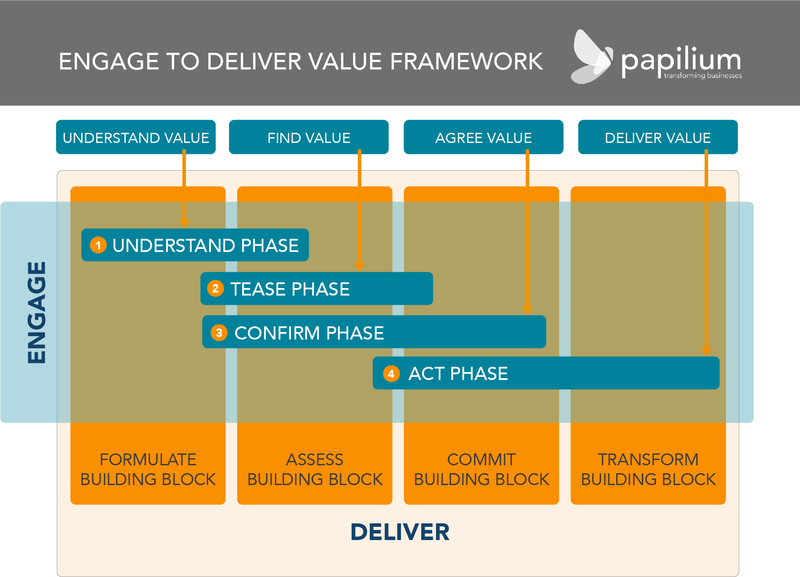 To ensure efficiency and effectiveness in the delivery, and to gradually build up commitment in client’ organisations, our consultants rely on our “Engage to Deliver Value” © framework. We see engaging all stakeholders as the most important, most time consuming and never-ending project activity. If one stakeholder is left out or if he fails to reach commitment to the storyboard, the value found might not be agreed upon nor might it ever be created over time. That is why we go step by step over four phases, guiding relevant stakeholders until they confirm and agree with the need, the ability, the itinerary and the goal of transforming the business. To ensure all stakeholders enthusiastically see the gain to turn key questions into disruptive value, we deliver factual evidence embedded in strong story boards. Facts are build-up by mining (big) data and emotions. We know that if one piece of evidence is missing in a story board, all identified value might be at risk. Throughout the process of transformation, we engage stakeholders on a common plan. This plan structures “Thinking”, “Engagement” and “Delivery” time (TED). We keep you on track as we believe a distorted balance in time-allocation between the TED components might jeopardize the progress along the four engagement phases. This framework allows Papilium to walk the talk and make our clients our real ambassadors.